Pinoy Wish Foundation, a not-for-profit organization, aims to give hope to Filipinos through its services. The foundation, an NGO member of the Israel Chamber of Commerce of the Philippines, strives to come up with sustainable programs targeted at improving the quality of life of those in need. Its programs span anti-poverty ventures and health and education, and it builds partnerships with other compassionate organizations around the globe to bring together the expertise, resources, and vision needed to inspire change. Pinoy Wish Foundation cooperates with these companies in identifying issues and finding solutions that will inspire sustainable development. The organization believes that the best way to empower Filipinos is to attack poverty at its roots. It does this by reaching out to poor communities and providing them with the skills, tools, and resources that will allow them to maximize their talents to earn and live a better life. In line with this, the organization creates livelihood programs based on the resources available in the communities it visits. It started the “Saganang Buhay” campaign that informs community members of the various ways they can fight poverty. It also conducts Pangkabuhayan Livelihood Programs, where it provides training for massage therapy, manicure, or pedicure, and other skills. 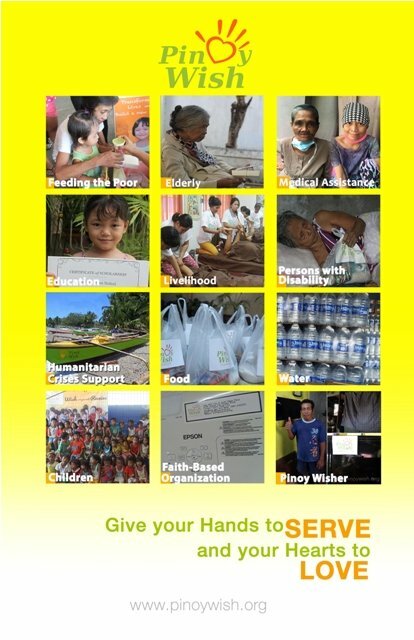 Apart from livelihood programs, the foundation also extends a helping hand to victims of calamities. It provides relief boxes called PinoyWish Food Pack that may sustain the needs of small families hit by a typhoon, for at least three days. With its Souper Sarap and Operation Buchog Feeding Program, it works with barangay officials to serve nutritious meal to hundreds of kids. The organization has various programs to help differently-abled individuals and the elderly. Some of the steps it has taken include providing healthcare and shelter, as well as access to food and water. It also has campaigns aimed at giving young people access to quality education that they can use to haul their families out of poverty. Churches that need help improving their facilities can also turn to the foundation. Pinoy Wish Foundation believes that when people work together, it is easier to survive the crisis and overcome challenges. This is why since its inception three decades ago, it has been partnering with other concerned individuals and companies to make better realities for marginalized members of the community. For more information on Pinoy Wish Foundation’s current and upcoming projects, visit its website at pinoywish.org or follow them on Facebook and Twitter (@PinoyWish).